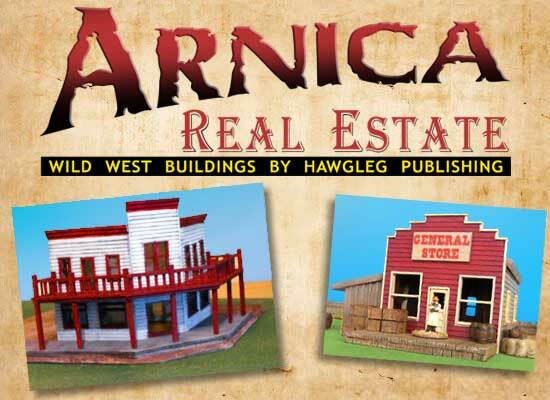 Hawgleg Publishing is pleased – and proud – to announce that it has acquired the rights to the Arnica Montana Real Estate 25mm resin buildings. 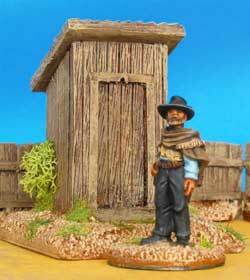 The deal includes the name, Website, and worldwide distribution rights to about 30 buildings and accessories for gaming in the Wild West. Within the week, ownership of the Arnica Website, www.arnicarealestate.com, will be transferred to Hawgleg. When that happens, a new Website will be launched and sales will be suspended for 1-2 months while the molds, masters, and other materials are shipped to Texas and Hawgleg completes setting up its casting facilities. "We've been talking about this for a while, now, working out details that would make this an easy transition for us and for the many fans of the Arnica Montana products" said Hawgleg co-founder Mike Mitchell. "Now that it's finally happening, we're ready to bust out whoopin' and hollerin' with excitement." Arnica creator Mike McGraw is in the last stages of packaging and shipping all outstanding orders. The deal does not include transferring any customer lists or sales information – this will be a straight-up change of ownership, with Hawgleg taking full charge and being responsible for casting and shipping all future orders. I’ve been the proprietor of Arnica Real Estate for a little over three years. The business has come to a point where it is taking more time than I have available to give it its due. With increased responsibilities at my daytime place of employment, it gets harder and harder to devote the time and attention required keep things at Arnica, Montana running smoothly. While the quality of the models has not suffered it has become difficult to get orders out in a timely fashion. After much thought as to a solution (preferably one that did not end with Arnica’s demise) I had a vigorous exchange of correspondence with Mike Mitchell of Hawgleg Publishing. After the haranguin’ and hollerin’ that is apparently required by Texas state law we hammered out a solution that would benefit all concerned. Hawgleg Publishing will be taking over ownership of Arnica, Montana and all that goes with it. As part of our arrangement I will still be making new building designs from time to time to be added to the product line. I have full faith in “The Mike’s” and Paul at Hawgleg. I believe them to be fully capable of continuing to produce the quality of product I like to think my customers have become accustomed to. Arnica Real Estate is in the best possible hands and will thrive and prosper in their care. There will be a transition period while new molds are being made and website material is transferred. During that time I will not be taking any new orders. Orders that I have in the shop now have been cast, finished and will be delivered shortly. Once everything has been moved over to the new site sales will begin again. McGraw will continue to work with Hawgleg as an advisor and consultant, especially as Hawgleg ramps up its casting operations. Additionally, he will now be free to create new building designs that can be added to the line in the future. "Mike McGraw has done a great job with the line and we look forward to maintaining the tradition of quality that he established," added Hawgleg co-founder Mike Murphy. "This will be a great chance to keep a fine line going and even expanding in the future as demand grows and we release new kits." All members of the Hawgleg team expressed admiration for McGraw's work, and an appreciation for why he wanted to move on to other ventures (see sidebar for a copy of his full statement). From a hacienda to the little house out back, Arnica Real Estate has buildings of all sizes. The trail from Montana to Texas has been an exciting one for the Hawgleg partners. “Mike McGraw approached us last year and wanted to know if we would be interested in buying Arnica from him… and we were all intrigued and a bit overwhelmed at the thought of the work this expansion would entail,” Mitchell said. Mitchell explained that, from the very beginning, the three of them had imagined eventually becoming a one-stop-shop for everything Western: miniatures rules, RPG rules, miniatures, buildings, terrain. 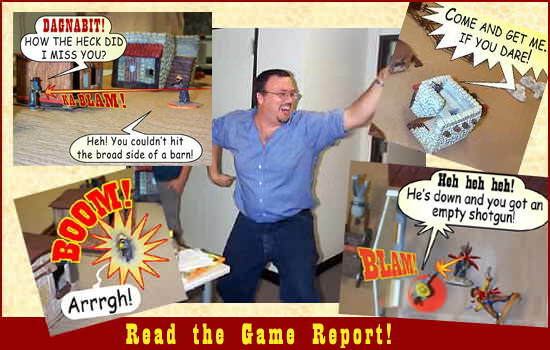 In their wildest dreams they even imagined a Gutshot video game. “We always wanted to do our own buildings. And the two Mikes have both spent the last year working on resin projects on the side. That way we would be ready when we decided to start on the buildings. But we didn’t think that would be for another three to five years,” Paul said. Then McGraw approached them with an offer that was too good to refuse. He said that Arnica had become so successful that it was taking over all of his spare time. He didn’t have time for his family, or to design new buildings or do other gaming-related projects. The Two Mikes (as some folks call Mitchell and Murphy) and Paul couldn’t have agreed more. “I've always admired the work that he put into Arnica buildings. Between the Whitewash City buildings and Arnica, Western game players have a wonderful choice of how to go with the setups on their table, and I find myself using both frequently,” Murphy said. Still, deciding to expand their business into resin casting was a big decision. There were already a lot of irons in the fire and most of the discussions were not about the details of the transfer, but were about what Hawgleg would need to do to manufacture quality products that maintained the high standards of the originals, and about how to upgrade their shipping and fulfillment operations to handle these new products. Finally, they decided they had worked out enough of the details and decided to move forward with the deal. COMING SOON: It'll take a month or so for new construction to begin, but when it does the streets will ring with the sound of gunfire and varmints gettin' Gutshot in buildings made by Arnica Real Estate. As stated previously, McGraw needs to pack up everything and ship it to Texas. Hawgleg needs to set up its resin casting facilities and make changes to its bookkeeping and inventory management systems to handle a more diverse product line. This means that Arnica products will not be available for sale for 1-2 months. Immediate plans call for getting all existing buildings into production. Future plans call for new buildings and more products. In the future, information about Arnica will be available at both the Hawgleg and Arnica Websites.